Brett Cherry on how universities can support the SDGs. If your research is in energy, which pertains to goal 7 – Affordable and Clean Energy, then it will likely also be relevant to goal 13 – Climate Action and goal 14 – Life Below Water. Clean energy results in decreased greenhouse gas emissions for mitigating climate change, reducing ocean acidification, and energy affordability connects to goal 1 – No Poverty. Got it? The goals are not separate, so goal 15 – Life on Land and certainly goal 16 – Life Below Water, are necessary to sustainable economic growth, although this may not be what we always see in practice. A good way to become thoroughly familiar with the SDGs is to play a game. Now before you think this might be a waste of time, hear me out here. Games can be an effective way of learning and absorbing information. If you give 15-20 min of your time for this activity it may help you see the bigger picture of the SDGs and your research. If you have kids or pets at home they might find it entertaining too. 2. Pick one of the SDGs related to your work. Maybe you are a chemist that is devising the latest food additives or new treatments for treating cancer. Or an ecologist or biologist focused on studying or conserving a particular species or group of species. If you’re a social scientist you may have an interest in specific communities, such as refugees. Whatever your interest pick the goal that is closest to your research. 3. Place all of the other SDG cards upside down and mix them up. 4. Now put it to the side and it’s time to go fish! Pick three cards at random and turn them over. 5. Now place them next to your focus goal and see what interlinkages you can find between them – you should read the list of targets and indicators for each goal to do this. If you’re struggling place one back into the ‘pond’ and pick another, but NOT before noting any links you found between your chosen goal and the ones you picked at random. Repeating this exercise, you should be able to get the gist of how the goals interact. I hope this activity helps you in placing your research or other activities within the wider context of the SDGs and the 2030 agenda, and generally a better understanding of the goals themselves. Since interaction is central to the SDG framework then the actions taken to achieve one will result in progress for another. But could they also cancel each other out? Or could progress towards one or a set of goals make others more difficult to achieve? Could for example progress in Goal 8 – Decent Work and Economic Growth, result in a rise in carbon emissions as it tends to in growing economies with rising populations? But it’s also more complicated than that and probably best not to assume that economic growth = CO2 emissions. If we get it right it could be the opposite. Could preserving Life on Land – goal 15 in turn have negative consequences for Goal 8? Perhaps but it’s also not that simple. Since biodiversity is at the foundation of the global economy, not to mention life, and underpins the natural resources we depend upon for survival, then goal 15 is necessary to goal 8 and vice versa. 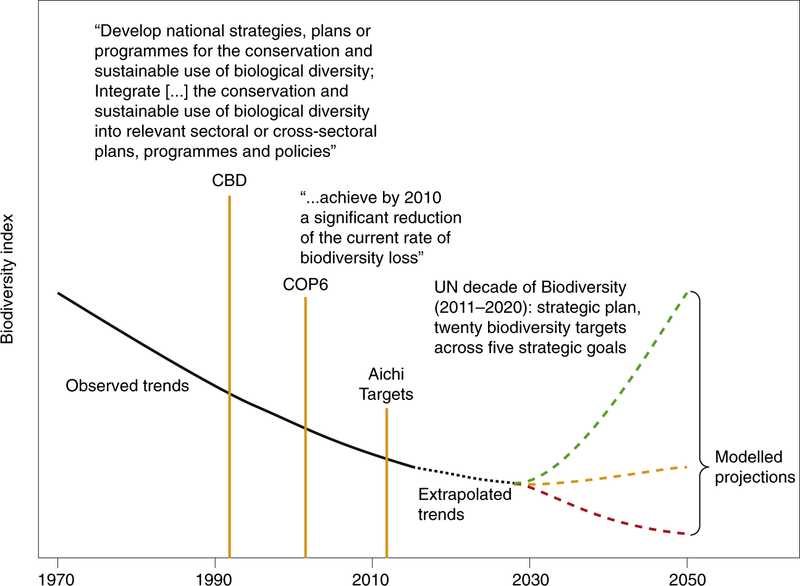 Now biodiversity is on a downward trajectory and finding ways to ‘bend the curve’ appears far from straightforward. There is a severe disconnect between how the world views economic development and ecosystems. This is why economist Jeffrey Sachs calls for fostering a ‘world consciousness’ to help end what political scientist David Held calls ‘gridlock’. Despite our best intentions for creating a more cooperative, sustainable society we are locked into economic systems and governance that are unsustainable in the long-term, perhaps the short-term also. New solutions are needed for sustainable development that combine sets of expertise from the physical, biological and social sciences, and engineering. If biodiversity is at the foundation of economy and civil society there must be ways to acknowledge biodiversity in economics, without destroying it. Environmental or ecological economics is one field that attempts to address this and there are of course others; in philosophy, ethics does too. In engineering, ways to integrate resources as in a ‘water-food-energy nexus’ are applicable to problems in sustainable development, which are often complex. Whatever role your research plays in the SDGs, it’s good to keep it in perspective by paying attention to the context of the 17 goals and 169 targets as a whole. In ‘leaving no one behind’, we also need to make every research effort count. To explore more about how the SDGs interact check out A guide to SDG interactions: From Science to Implementation. You can also read the Science and Technology Major Group Position paper presented at the UN High-Level Political Forum 2018. This post was shared with permission from the the Global Challenges Academy Blog.